In October 2000, Poseidon - UK Ltd. was formed after over twenty years of being distributed through a third party in the UK, from UWI, UWI Circle and lastly Divex. It was formed as an independent company to provide 100% support for the UK Dealers and customers of Poseidon. With stores and offices based in Hampshire we are in a position to react instantly to customers needs offering immediate delivery on most of the product range. With deliveries every week from Sweden, out of stock situations are rare. 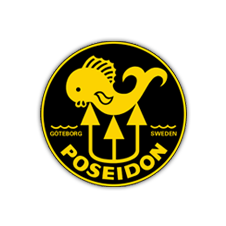 Poseidon, a Swedish company formed in 1958, to build state of the art diving equipment, today enjoys a reputation for being market leaders in revolutionary, and innovative design. In June 2002 Poseidon produced the Xstream regulator, the first and only regulator in the world to be certified to 200m and gas from Trimix to 100% O2. Still an independent company not controlled by the restraints of a multi-national organisation, both Poseidon Sweden and UK aim to supply quality equipment with quality support. What is hidden under the water? That was the question that Ingvar Elfstrom asked himself as a young man in the mid forties. He used to sit and try to see the bottom of the sea on his fishing trips together with his father. The problem was that there was no diving equipment to buy. In order to explore this world he was forced to manufacture his own equipment. 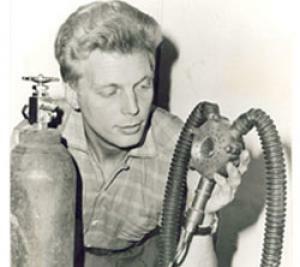 The first prototype of a breathing regulator was made in 1954. The very same year Ingvar started the diving club Poseidon, where he got the chance in exchanging ideas with other interested people. The first series of twin hosed regulators with the name Poseidon Senior, was manufactured by Ingvar in his kitchen. After a few years he started to develop his regulators with the help of Rolf Tisrand, who had been with the company since 1957. Their next regulator was the Cyklon Junior, the first ever manufactured single hose regulator in the World designed for diving. Today known as the Cyklon 300 and Cyklon 5000. Together with his friend Dennis Osterlund sales started to improve. Products were sold under the brand name Poseidon and marketed by a company called Aqua-Sport. 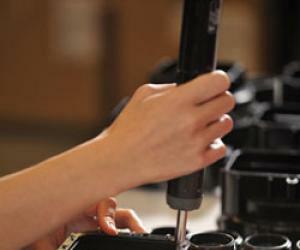 The equipment that they could not produce was imported from foreign manufacturers. The Company continued to grow so Ingvar and Dennis moved the production of regulators from their kitchen sink to a small rented garage. The first shop was opened in Gothenburg in 1958, shortly after followed by Stockholm and Malmo. The accessibility of a neoprene diving suit, in the fifties was a big problem as everyone thought that the permeability of the neoprene would allow water to seep through. The American Company Rubatex produced a think rubber material that after a small modification could be used in the manufacture of wet suits. Poseidon was now manufacturing regulators and wet suits, quite an improvement since the kitchen sink days. In 1963 Poseidon got a request from the Swedish Navy, would it be possible to produce a suit that could be used for longer exposure times in their cold northern waters. After some research and experimenting with different materials and manufacturing techniques, they produced a dry-suit that met the Navy's demands. The first gastight neoprene dry-suit the UNISUIT, was delivered to the Swedish Navy in 1963. A name that is synonymous with drysuits, as Hoover is to vacuum cleaners. The very same year Poseidon started to export products. 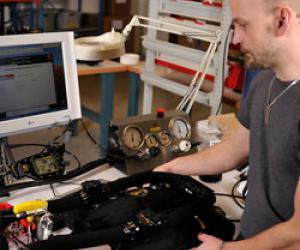 Ingvars big dream came to be realised in 1984 when a factory fully adapted for diving equipment manufacturing was built. Ingvar died in 1998 at the age of 70 years. His life's work was to make the exciting world under the surface of the sea possible to explore by everyone. Poseidon today enjoys a reputation as quality equipment built to a very high specification used by the Military and commercial divers throughout the world and a brand leader in the Sports market. Ingvar would be pleased if he could see Poseidon now.